This is one of a series of guides created by Radiant Law to help in-house legal teams improve their contracting processes. You can find our other guides here. Although these guides are focused on handling commercial contracts, many of these technologies and approaches can be applied to other activities that you do. The questions can be answered in the browser using a form, but there are alternatives such as using chatbots (although these tend to focus on access to justice use cases). Think of it as a one-shot process: once you’ve created the initial document, you are usually done with document automation. 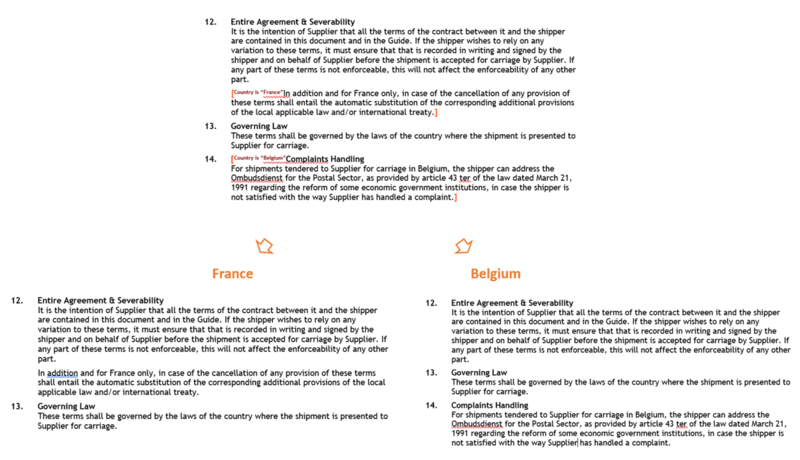 In some cases the document that is created is ready to send to the other side and you’re in to the negotiation stage. Alternatively, use document automation to get you most of the way there with a draft and then tweak to deal with the unique deal points. Creating a contract using document automation takes a few minutes. 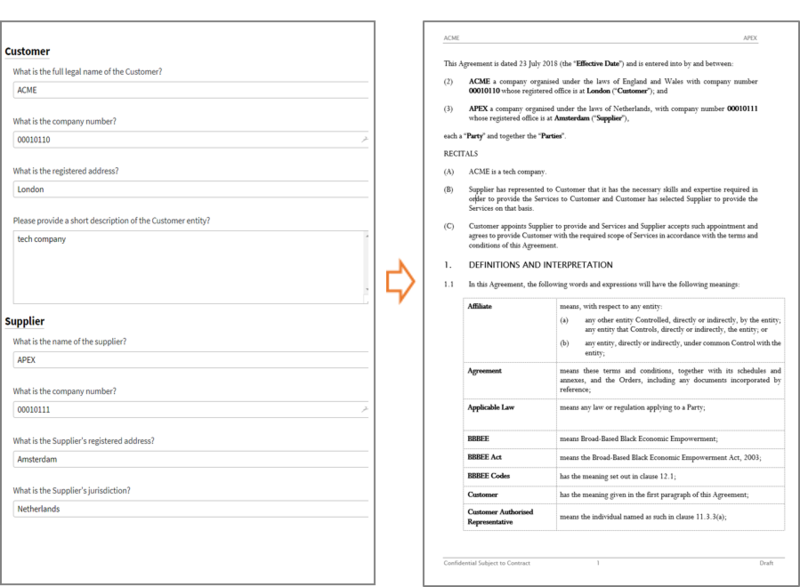 You can also create a suite of related documents at the same time, based on the same answers. It can also be used, with the right contracts, to allow the business to create a contract without needing to refer to legal. There is huge business value in speeding up entering into contracts. Faster sales contracts improve cash flow for the business. Faster procurement contracts improve business agility. Spending less time creating your contracts frees you up to deliver more and makes your job more interesting as you can focus on the more complex work. Unfortunately we all regularly make mistakes. Document automation removes many of those opportunities for errors. Document automation also brings a rigour that ensures that the key issues are addressed in every contract, rather than relying on the user to remember - it acts as a checklist. It also helps ensure that previous deal documents, where key provisions were removed as being not relevant, aren’t used as the basis for the next agreement. Template agreements are generally getting longer and more unwieldy. As issues come up in negotiations, points are added to contracts, and it is rare that the template gets shortened. There are also limits to how far you can expect a user to go in tailoring a Word version of a contract for the particular circumstances of a deal. Document automation lets you break out of this cycle. You have a way to ensure that issues are considered every time as the contract is created but only addressed in the agreement when relevant. The result is shorter documents that will be faster to negotiate as they are focused on the key deal issues. Document automation has an interesting side effect. When legal teams create or update their templates, they will often go through an epic process of drafting, feedback (aka drafts sitting on team-mates’ desks for weeks) and internal stakeholder management that, like a law of physics, seems to always take six months. At the end of this process, an announcement is made to use the new template. No one has the appetite to change the template ever again and there is a perennial worry that if small changes are made then the users won’t know which is the right template. There’s a better way. Document automation allows you to ensure that users are always going to the right place to create their contracts. This means that you can keep updating the template as you identify improvements that are coming out of negotiations or as the business changes its products and needs. These iterative improvements allow you to “knock the edges” off your contracts, getting rid of needless negotiation and having a far greater impact on the end-to-end speed to enter into contracts than just speeding up the drafting stage. We’ve found that the most important point in the businesses experience working with legal is initial responsiveness. No-one is able to sit around, waiting for the business to ask for help, to immediately create a draft. But if you give your business users the ability to create a draft safely using a document automation system, then you will be a legal hero. Between these two simple actions, there are no limits to how tailored you can make your contract. We are going to cover these steps below, but it’s helpful first to understand how these systems work. There are three parts to defining the contract that are set up in the automation stage. Logic that specifies when optional language is included, depending on the answers to questions (or does calculations based on the answers). IF the user answers “customer” to the question “Which party will own the IP created under the services contract?” THEN include the IP transfer clause ELSE include the no transfer of IP clause. Different systems will have different ways of implementing these three parts, and some systems are much easier to do the automation. As we will come back to below, one of the key (and underestimated) factors in choosing a system is how easy the system is to use during the automation stage. A final point to note: the logic (such as if… then… statements) that are used in automating your template are a way of capturing expertise about how to handle different situations. You’re really building a mini expert system that lets you treat your contracts as a branching system of alternatives, rather than linear locked down templates. Be warned, you may start to reason differently about your contracts. We regularly see companies caught up in complex evaluations of the many systems available in the market. The larger the company is, the worse this process gets. Getting something in place is better than analysis paralysis. We highlight some of the points to consider below, but this is an area where getting going is important. Migrating templates from one system to another in the future is simpler than creating them in the first place. Yes, you will have to rebuild them, but you will have done the hard yards of figuring out the logic and language, which takes time and is why starting sooner rather than later matters. And you don’t necessarily need to buy your own system. We regularly just add clients to our document automation cloud system and get their first template up and running in a week or two. Point solutions: These are systems that just do document automation and nothing much else. They are very good at what they do, and they cover adjacent stages such as intake and approval workflows. End-to-end solutions: These are systems that cover the full contracting process from intake through to contract management. Traditionally, these suppliers came out of the contract management world and moved left to encompass the full contract lifecycle. Popular with teams such as procurement, they may not be as good at any particular activity as a point solution, but they have the advantage of connecting all the parts together. Choosing between the approaches is a hard decision. A good point solution is going to be better; in the right situation an end-to-end solution may be good enough. Point systems can often be integrated with other systems, but it can be a pain. End-to-end solutions come with integration (at least between the different contracting stages), but are less flexible, often opinionated and may be suboptimal for all your different use cases. Be careful of end-to-end solutions that tick every box in the contracting process but are weak at each stage (some of the older contract management systems - we’re looking at you). We prefer point solutions at Radiant, so we built the integrations needed to make it work and can help you with this. There’s no right answer for this one, other than not being paralysed. Turning on/off language: you may have simpler document automation already in your business, for some customer contracts that only require fields to be completed (like names and addresses). The simpler systems don’t allow for blocks of language to be turned on/off and will not be capable of handling complex contracts. Make sure that your solution has this feature. Editing: a simple editing environment is going to be very important if you want adoption by at least your most technologically-friendly team members. Ask for a demo of how this part works, and run like hell if it needs a programmer to create your templates. Think through in advance the kinds of customisation of your documents that you are likely to need and ask the vendor to confirm that their system can handle the intricacies. For a real test ask the supplier whether they can handle “repeats within repeats” - e.g., can the system let the user specify an arbitrary number of entities and for each entity specify an arbitrary number of attributes to appear in the contract (such as specify multiple companies and for each multiple director details)? Integration: it is becoming increasingly important to be able to integrate document automation with other systems (through APIs). Integrations can happen for source data (e.g., some of the answers are drawn from other systems) or for where the document is sent next (e.g., e-signatures). There are also times when being able to treat the system as a “black box” which can be sent data and it returns a completed contract is very useful. If integration is going to be important, ask which other systems have already been integrated and for an opinion of the API from someone technically-minded. Browser v Word plugins: some of the contract management system vendors have implemented Word plug-ins to give document automation capabilities. The browser based systems tend to be much more powerful. Word plugins are best used in the negotiation stage after the contract has been created (or for the automation stage). Hosting: All lawtech now comes with a cloud option, many of the newer ones are only cloud based. Cloud based systems will be faster to implement, but if your IT department is still stuck in the dark ages and insisting on only using systems hosted in their data centres, then be aware of that at the beginning of the selection process. Licensing model: some suppliers charge a flat fee per organisation, some charge per end user. If you need a large user group (e.g., you want to let any business user create an NDA), then check that you aren’t going to be paying a fortune for the system. Approvals: Some of the systems offer additional functionality for adjacent parts of the contracting process, such as approvals processes (which can be helpful when a business user creates a document, but given the answer to a question, legal will want to check the document before it goes out). Analytics and Reporting: some systems are better than others at tracking usage and allowing reporting. These reports can be helpful in understanding where you have take-up of the system and can help identify opportunities for improvement. At Radiant, we use Contract Express from Thomson Reuters and Docassemble (an open source option that we have integrated into our toolset). The market has exploded with options, but here are some of the more popular choices. All are excellent systems and worth considering. Document automation requires bringing together legal expertise in the subject matter and technical expertise in the system. Ideally this is in one person, but the reality is that the editing systems are still complex enough that you can’t assume that every lawyer is going to learn to automate their documents. The best outcome in practice is that a legal expert (who understands enough about the system) works with a technical expert (who understands enough about contracts). The more legal background the technical expert has, the better, but people combining deep skills in both are unicorns (well, one or two exist). There are a number of options for how you bring automation expertise into your company. Note that not all of these options are possible if you choose a system where the supplier has to do the automation, which can be the case for the newer and less mature systems). Also, the UK market is some way ahead of the US market in this area and the external expertise in document automation in the US is limited. In-house: You either hire an expert or one or more members of your team teach themselves to use the document automation. If your company is big enough this may be the long-term best value, but the learning curve is steep and if your team members are doing this as a side project, progress may be very slow. Hybrid: You bring in an expert to do the automation, who sets up your initial templates and also teaches team members how to do the automation going forwards. This is likely to get you going much faster and leaves expertise in your team. External: You appoint a point person in your team for coordination and they work with an external supplier to do the automation for you (often with a retainer for ongoing changes). Managed Legal Service: A managed legal service provider should be bringing document automation to the party as part of the service, with you having the benefit of the technology without having to learn how to create templates. Radiant Law (and ConRad in the US) - we provide document automation as a managed legal service and as an external provider. BamLegal and Syke - can support you through the hybrid or external model. Document automation vendors - vendors such as Thomson Reuters and Clarilis provide automation for their systems as an external service provider. Most common first: choose the most common contracts that you create as the first to automate. If they are complex, get the team at least part way there with the first draft. If they are simple, aim for completeness. Champion first: your team will inevitably have a range of opinions about bringing in newfangled technologies such as document automation from enthusiastic to deeply sceptical (for a deep discussion of the uptake of innovation, see Professor Bill Henderson’s excellent Legal Evolution site). Finding an enthusiast who identifies opportunities in their world and then using the results to convince others, is a well tested route to bringing your team along with you. Your champion may be in the business, so consider looking wider than the legal team. We highly recommend getting a template up and running as quickly as possible and then improving it over time. Think of your threshold as the absolute minimum number of questions/options to make the system marginally faster and more useful than doing the drafting manually. Be careful to avoid disappearing down rabbit holes trying to cover every option. The law of diminishing returns applies and you will identify the most useful additional options quickly once your automated template starts to be used. Flag the clauses that are optional and the variables: this can be as simple as square bracketing the relevant clauses and adding a comment to show which row of the table below applies. Variables (e.g., party name) just need to be flagged with a comment once. Create a table of questions: create a numbered table in Word that sets out the questions and explanatory text (which turns out to be an important part of guiding users and making the system more useable). 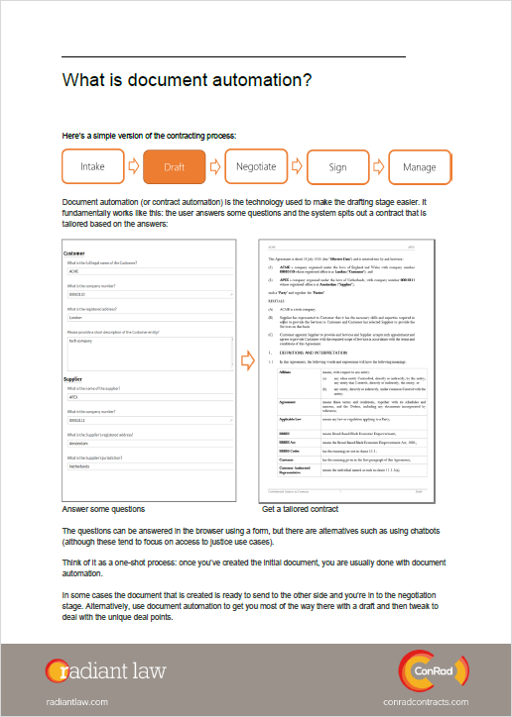 Use comments or notes in the templates to link the questions to the relevant part of the template. Automate the contract: with the information above the person doing the automation should have the vast majority of what they need to complete the automation, bar some clarification. Compare the output (with one set of options) against the original template to make sure that it looks right. Once you’ve confirmed that version of the output, create a few other outputs with the largest structural differences to the first output and then run comparisons to do a sanity check. Test the questions with someone else - ask them to create a document and watch what they do and where they struggle. However simple you think you’ve made the questions, this will inevitably throw up surprising issues that can be easily fixed. For more on user testing, see Don’t Make Me Think. Launch: Once you’re happy with the output (and this should be a week or two process, not months), get your users using the system and have a single point for them to go to raise queries and suggestions. Keep iterating (and keep adding templates): get into a rhythm of looking at points that are coming up in negotiations that can be avoided by changing the drafting. Run a campaign to add more documents for automation, based on successes to date. Document automation is one of the most powerful technologies to improve your contracting process. If you’ve done the hard yards to create good templates, it can be quick to implement and make you a hero with the business. The pitfalls are paralysis and perfectionism. Get something up and running and keep improving it over time.